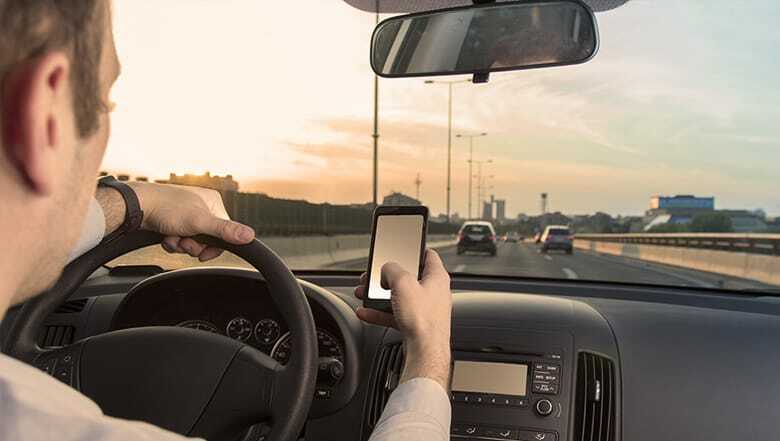 With the dramatic increase in cell phone usage and texting in North Dakota and throughout the U.S., distracted driving has become a serious problem on roadways. The National Highway Traffic Safety Administration estimates that distracted driving claimed the lives of more than 3,400 people nationwide during 2015. Injuries related to these accidents can take a huge financial and emotional toll on victims and their loved ones. If you or a loved one has been involved in an accident caused by a distracted driver, you need to hold the at-fault driver accountable with the help from a knowledgeable lawyer. With personalized attention, the experienced North Dakota auto accident attorneys of Larson Law Firm, P.C. handle every detail of your injury claim so you can concentrate on your healing and recovery. This type of distraction occurs when a driver removes his hands from the steering wheel to reach for an item like a cup of coffee or to change the radio station. Visual distractions occur when a driver takes his or her eyes off the road to focus on something inside or outside of the car. This may include a cell phone or passenger within the car. These distractions occur when a driver’s mind drifts to something else, causing them to no longer pay attention to the road. A distracted driving collision can have serious consequences, from property damage to injury or even wrongful death. Our skilled North Dakota distracted driving lawyers act on your behalf to obtain the maximum compensation you deserve. Texting or talking on a hand-held mobile device are the most common activities that distract drivers, especially inexperienced or teen drivers. In the state of North Dakota, it is prohibited by law for drivers to text while driving. Texting and talking on a cell phone requires physical, visual and mental attention which makes it especially dangerous while driving. Getting hit by a distracted driver can be a life-altering experience for victims and their families. Our skilled North Dakota car crash lawyers show at-fault drivers and insurance companies that we mean business. We won’t stop until we win the fair settlement that you deserve. Time is of the essence when you’re involved in a car accident, especially if you suffer from debilitating pain and can’t work to pay your bills. The attorneys of Larson Law Firm P.C. are your allies. If you aren’t sure how to begin the legal process, we offer a free initial consultation to discuss your case. If your injuries keep you from traveling to our office, we make home and hospital visits. From our office in Minot, we are proud to represent clients throughout Ward, Williams, McKenzie, Pierce and Mountrail Counties. To learn more, complete our contact form or contact us by phone at 701-484-HURT.